Hallo, I tried to use 'finite difference' method to solve a Initial Value Problem(IVP). For the two boundaries I used periodical condtion and for the differential operators I used 4th degree center approximations. But as result, I got this thing. 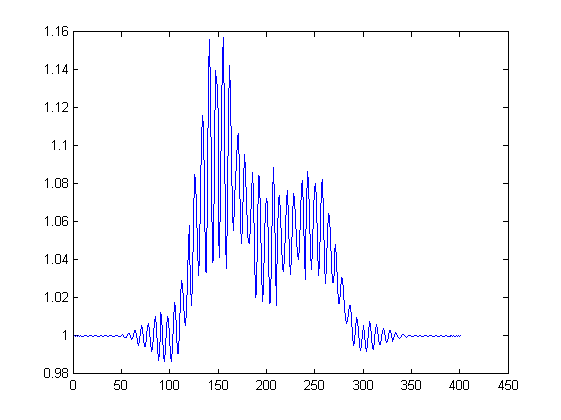 Where comes this strange oscillation What do you think could be the problem. Should I use a smaller x stepsize? Will use a forward approximation help? Thanks. Actually I am using matlab's odes15s. The strange thing is that, if I use a biger x stepsize, say 0.1, i will get a smooth result. With s stepsize 0.06, I will get the result showed in the picture. I tried ode45, which is based on an explicit Runge-Kutta (4,5) formula, the Dormand-Prince pair and ode23tb, which is an implementation of TR-BDF2. I got the same result. Browse other questions tagged finite-differences na.numerical-analysis differential-equations or ask your own question. Is is preferable to use a difference formula of higher order of accuracy for spatial derivatives to solve this IVP problem ? Is the trivial solution the unique solution to the following initial value problem?